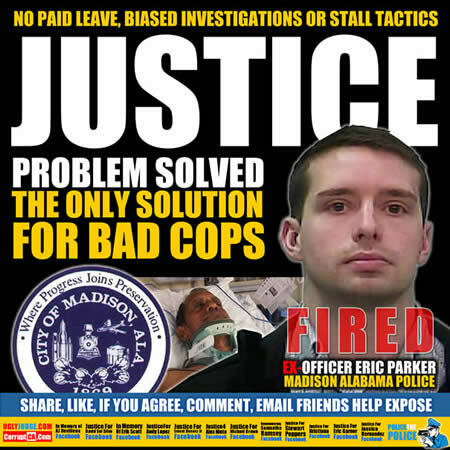 Madison Alabama Police Officer Eric Parker fired. It’s about time we stop accepting police, judges or government are above the law. Public servants must be held to even higher standards and harsher punishment than the public. We count on these people to be better, have more respect for law and to protect us. We must demand the absolute highest morals, ethics and honesty, period. With thousands of cases of police brutality, murder, misconduct by judges and fraud committed by government, America is no longer the greatest country in the world. Freedom, equality, rights are just words that mean nothing until you try and use them. An elderly man was recently visiting Alabama from India when he found himself beaten by police who left him paralyzed. Madison, Alabama police brutalized the 57-year-old Indian citizen who had committed no crime, he was only going for a walk on the sidewalk outside of his son’s home. Now, one officer is being charged for leaving Sureshbhai Patel temporarily paralyzed and hospitalized with fused vertebrae, as a result of the severe beating he received from the police. Eventually, the two officers turn Patel around and have his hands behind his back. At one point, as another patrol car pulls up, Eric Parker yanks his arm and slams him into the ground. Patel can not put out his hands to break his fall. He would require cervical fusion and remains in Huntsville Hospital with limited mobility in his limbs. His son as of Tuesday said his father could not move one leg at all. The video continues, with officers trying to get the man to stand. One officer begins picking dirt and debris off of him. The concern slowly becomes evident in their voices.